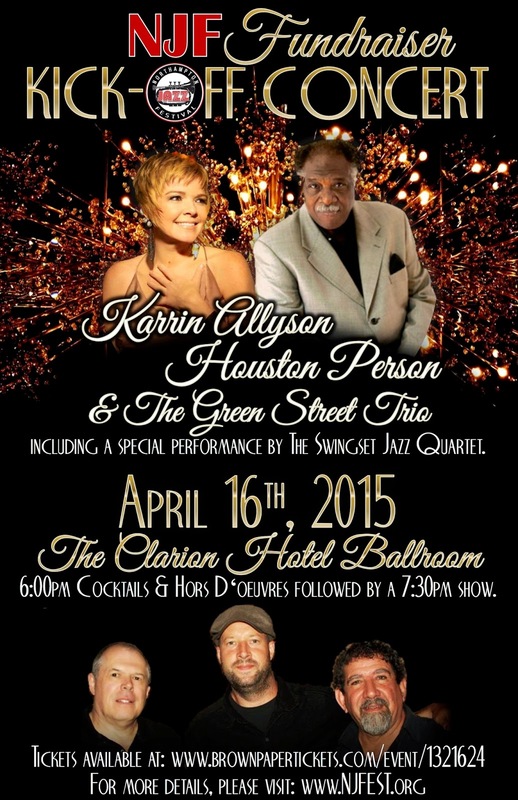 Thursday, April 16 at 6:30 PM Houston Person and Karrin Allyson will perform in the Ballroom of the Clarion with the Green Street Trio. This is a fundraising concert for the 2015 Northampton Jazz Festival. At that time we will be announcing the line-up of performers for the September 12th main stage concerts and other events that will be happening throughout the five day festival. Since the 1960's Houston Person has recorded more than 75 albums as a leader, and countless others with musicians such as Low Rawls, Bill Charlap and for many years with Etta Jones. His career started when he joined a service band in West Germany along with Don Ellis, and Cedar Walton to name a few. He has performed in the hard bop and swing genres but is best known for this distinctive sassy soul jazz. Karrin Allyson has recorded 14 albums as leader since 1992, four of which have been nominated for best vocal jazz album. Aside from being a world class jazz singer she is also an accomplished pianist and song writer. Houston and Karrin will be accompanied by the Green St Trio, Paul Arslanian on piano, George Kaye Bass, and Jon Fisher drums. Starting off the evening will be the Smith Academy Jazz band featuring Kelly McDonald, Gavriel Muellejans, Paul Weston and Gavin Watson. Also included in the ticket price are hors d'oeuvres and a cash bar. This benefit concert will kick off the 5th Annual Northampton Jazz Festival to be held from September 8-12. The Jazz Festival is a free event and the proceeds of this benefit concert will help us to keep it free and open to all.